This morning I had a profound vision in Sedona, on the road to Antarctica, of one of 24 time zone meditations I will conduct on 12.12.12 with your support. I have little ego about all this. It’s brilliant work I am simply channeling by the spirit guides. 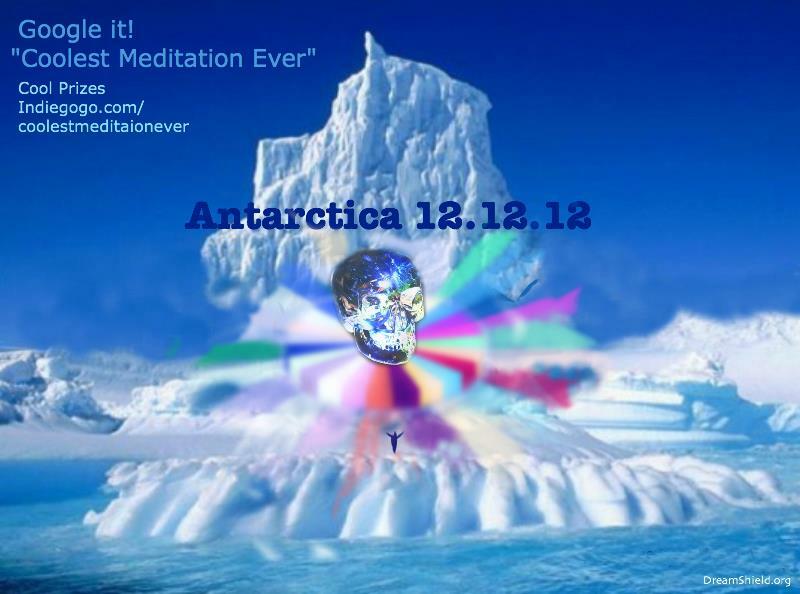 The vision I saw today was shift of man’s predilection to War to overriding Peace.I stood on the ice of Antarctica on 12.12.12 and raised my hands which tingled with massive energy. Weapons, from hand guns to atomic missiles, smashed from the ice the medicine wheel I had laid out in the snow. The sound of sorrow of the collective human soul became a raging vortex of all the weapons of the earth spinning high about the arctic landscape. A hurricane of death.I saw my tiny human form, my crystal skull glowing through my 60 year-old pale skin, skin, strike the snow with my walking stick, like some modern Gandalf. “SHIFT!” my voice echoed through the crystals of icebergs nearby. A chill, not from the cold, but the magnetism of South Pole, sent a shiver down my spine. Doves of dazzling white sprung to flight from the snow. — One dove of peace for each weapon of death. The doves began to glow with an intensity greater than the sun. The angelic doves grabbed hold of the weapons with impossibly sharp talons and drew out negative energy from the weapons. Around and around the doves worked their magic until the weapons turned white-hot, molten.The melting weapons and doves forged themselves into single molten blob. The silver blog sank, steaming into the mile thick ice sheet of Antarctica. I peered over the precipice into the deep shaft and beheld a silver spaceship lifting off! No UFO, this was a human made spaceship. I heard angelic singing as the ship roared past. Humanity’s war energy had shifted from war to peace to reach the stars. Will this really happen when I reach Antarctica? My spirit guides won’t say. So we’ll only know when I get there.